The Super Eagles will aim to achieve a 12th triumph over the Lions of Cameroon when both teams go for each other’s jugular at the Godswill Akpabio International Stadium, Uyo on Friday. In 19 previous encounters, Nigeria have been winners 11 times, with Cameroon winning four times and four matches drawn. Of these games, three happened to be the Final matches of the Africa Cup of Nations (all won by Cameroon, including a nail –biting penalty shoot-out session in Lagos in February 2000), and there were two different fixtures of FIFA World Cup qualifiers (1968 and 1989) shared equally. Nigeria eliminated Cameroon from the qualifying race for 1970 World Cup finals, winning 3-2 in Douala after a 1-1 draw in Lagos. But the Lions took their revenge in 1989, snatching the minimum win they needed in Yaounde (1-0) to kick the Eagles out of the race for Italia ’90, only two weeks after Sam Okwaraji’s death. While Cameroonians treasure the wins in Abidjan (1984), Casablanca (1988) and Lagos (2000) that gave them three of their five African titles, Nigerians have sweet memories of a 2-0 defeat of the Lions in Ibadan (in 1989) and a gutsy 2-1 win over Cup holders Cameroon in the quarter finals of 2004 Africa Cup of Nations in the sunshine of Monastir. When the two teams last clashed, at the Edmond Machtens Stadium in Brussels in October 2015, the Eagles ran away 3-0 winners. Efe Ambrose rose highest in the Lions’ box to nod home a Mikel John Obi free –kick, before Moses Simon rounded the goalkeeper for the second goal and Odion Ighalo headed the third after a splendid pull –out by Elderson Echiejile. 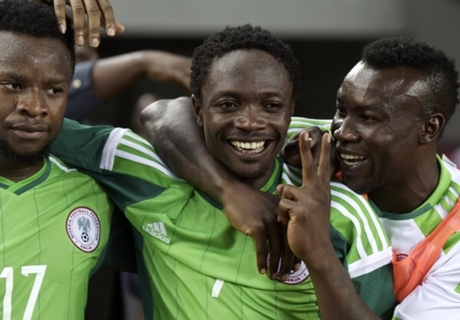 Mikel Obi, Simon, Ighalo and Echiejile are in the Nigerian squad that will seek a repeat scoreline on Friday.